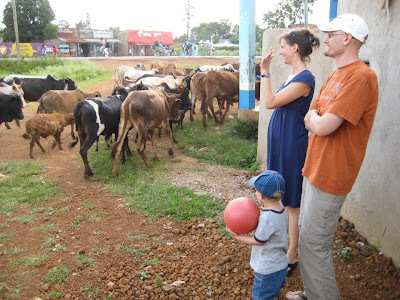 We recently moved from Busia to Kisumu Kenya – a difference most of you reading this probably don’t appreciate. They’re both little known places on the global scene. But for us, the difference has been immense. Busia is a small border town with one main road, flanked by dukas (shops) and fundis (carpenters/welders) and small hotels, lots of foot traffic and wandering livestock. Walk 10 minutes off the road and you are basically amid shambas. 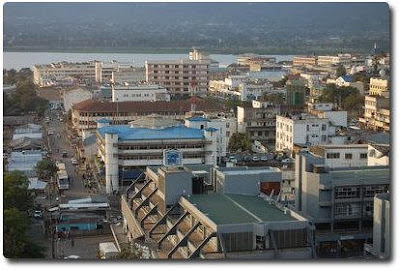 Kisumu is the third largest city in Kenya with paved roads and restaurants that serve more than ugali and beans. There’s actual traffic and sidewalks. You can buy more than one variety of cheese. There’s a hospital with fancy new equipment and doctors who have studied abroad. There’s an international school. And… where we live in Kisumu is quiet. But, then again, where we live in Kisumu is quiet. Let me explain. Kisumu has neighborhoods complete with the inevitable class divisions – something we did not experience in Busia. So, of course, we picked a “safe” neighborhood close to the office and immediately find ourselves surrounded by quiet. You’d think this would be a relief. 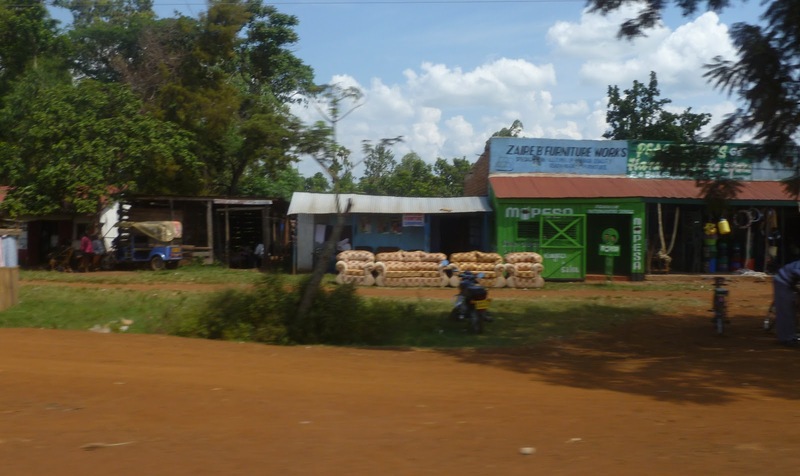 But we had come to enjoy being so surrounded by people in Busia - so unavoidably enmeshed in the community. Sure, there were not a lot of things you could "plan" to do other than visit a hotel/restaurant or go to the market. But something unplanned always seemed to happen. Visitors stop by unannounced. A 10 minute walk around the house would mean an encounter with an old friend or someone looking to be new friend. And best of all, Caleb had instant spontaneous playgroups just by stepping outside our house. What he lacked in playgrounds, he more than made up for in playmates. Here. This picture pretty much sums it up. 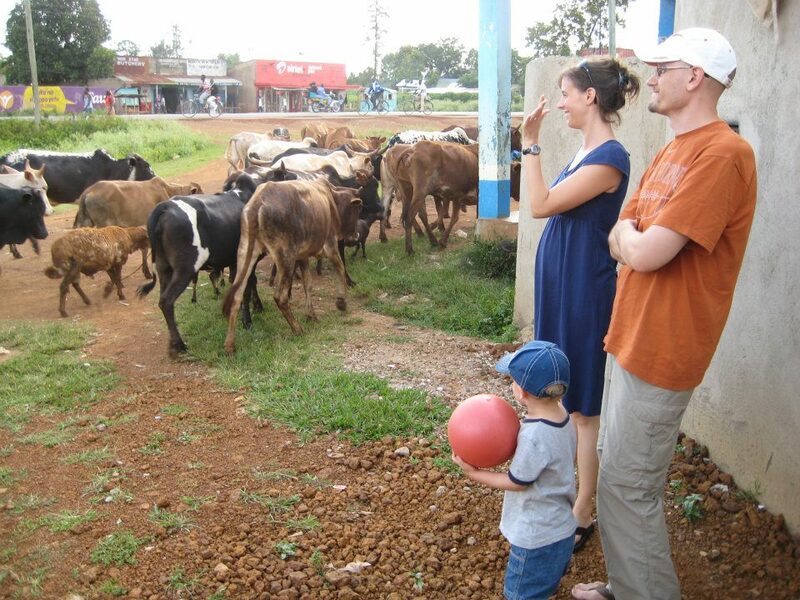 We’re just outside our house in Busia. Smiles on our faces, waving to people we know, Caleb with ball in hand assured of playmates. This is the view from just outside our new compound. It's definitely pretty, but also pretty desolate. Colin and I are busy enough to not mind the boring quiet. Caleb is quite another story. The other day, after searching the neighborhood for playmates to be met by only locked gates and quiet streets, he turned to me and said, “Where are all my little friends? I want to find some little friends.” and it nearly broke my heart. I guess it’s an age old story. You move from a village to a city and gain in convenience and opportunity what you lose in community. We’re actually lucky in that we have 3 other houses in our compound of friendly people, some of whom have invited us for tea and all of whom are lovely to Caleb. There are even a few kids. But something seems to happen when you move up the socio-economic ladder. People’s time is precious and planned out and there’s not the same expectation and appreciation for unplanned visits or easy way of just being together without an agenda. It's funny. There is one sliver of our lives here that is reminiscent of village life. At night, the househelp and guards of the compound get together and sit outside around that modern campfire, the television, with their kids, forming an easy and relaxed kind of community. The kind you don’t plan for or drive to but just exists. The kind we left in Busia. I know I’ll never be totally a part of that. But sometimes I go out there with Caleb and he plays with the groundskeepers little girl and I just sit with them and try and revel a bit in what we left behind. Hi! I am also Kim and lived in Adungosi Market for 2 years and can so relate to the move you made from Busia to Kisumu :) I used to ride my bike into Busia every week to go to the *big* market there. I also spent lots of time in Kisumu meeting up with other Peace Corps volunteers, eating kuku and drinking tusker at the Mamba hotel! So glad to find your blog-we have a common friend Anjali-thank you for writing and sharing your stories. Cheers! Hi Kim!! What an amazingly small world. And I'm so glad that this weird transition actually resonates with someone. It's hard to exactly put into words. We just met some other peace corps volunteers this weekend at Kiboko Bay (maybe today's Mamba Hotel??) Another example of two very different worlds colliding. Anyway, I hope you enjoyed your time out here as much as we are! Me too!! But we just traveled back to Busia today for work, and literally Caleb's friends came running from every direction to play with him. It warmed my heart. And I know it'll get better once we settle into Kisumu a bit more and meet more people. It takes time, you'll find playgroups or activities. And here's to more than one type of cheese! I'm sure my little buddy will make friends but my heart is sad for his losses. Any play groups??? You're right. I know it will take time, and we'll put him in a 1/2 day pre-school after what's his name pops out where Caleb is sure to make lots of new friends!